Castrol used Britain's Driver and Vehicle Licensing Agency to sell motor oil to millions of motorists in a Minority Report-style ad campaign this week. Castrol used another firm to obtain the data, which is believed to have contained most of the 34million-strong driver details held by the DVLA. This identified the make, year, engine size and model of vehicle, enabling Castrol to specify the lubricant suitable for each car. Liberal Democrat transport spokesman Norman Baker said: ‘This completely inappropriate and unacceptable behaviour by the DVLA shows how cavalier it is with motorists’ information. Science fiction movie-goers were treated to an advance look at this future in the movie version of Minority Report, screened in 2002. In the film, an iris-scanning device identified individual consumers passing advertising screens; each customer was given a personalized pitch. 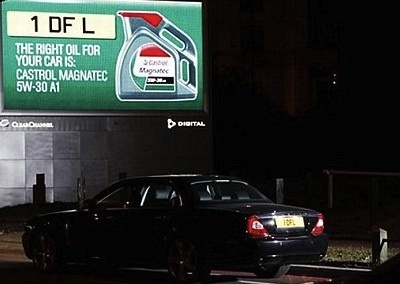 From Drivers' details sold by DVLA are used in bizarre roadside adverts for Castrol via our friends at Frolix_8.